Choosing a favourite planet was tough. As a kid I was fiercely passionate about two things: animals and the solar system. I ended up following the path of the former and never kept up to date with the latter, but the inner passion for astronomy has never died. Space is just so freaking cool. Our solar system alone is filled with so many fascinating planets, dwarf planets and all their satellites — choosing just one felt treacherous. 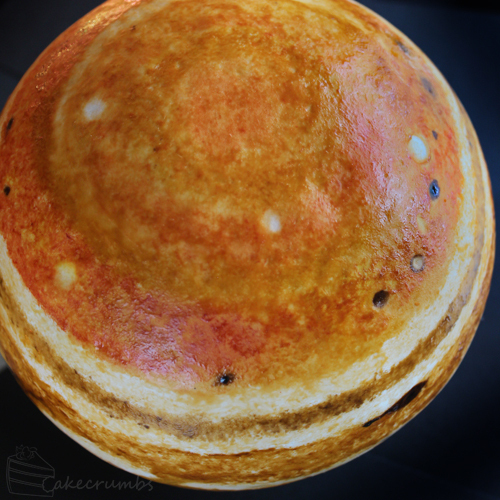 In the end I settled on Jupiter predominantly for one reason: its Great Red Spot. The giant anticyclonic storm has always been one of my favourite things and continues to be a subject of great fascination for me. At thrice the size of the Earth it’s bewildering to comprehend the actual magnitude of it. 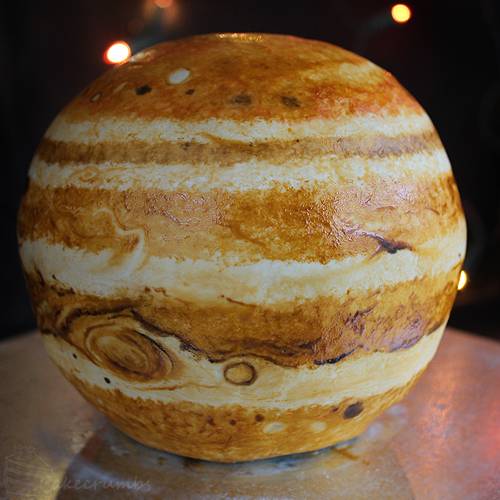 If I absolutely have to choose a favourite planet, it’s got to Jupiter for that storm alone. It’s also so iconic. It’s a characteristic feature almost everyone is familiar with, making it easier to create something that would be instantly recognisable. The red spot is one of a number of storms you can see all over Jupiter. Some of them last hours, others last for centuries. The red spot had been around since the early 1800s, and it’s possible that it may remain as a permanent feature of the planet. It would be fascinating to see Jupiter if the storm did in fact die out, or if another large one were to appear. The smaller white storms are made up of cool clouds in the upper atmosphere, whereas the brown dots are composed of warmer clouds in the lower atmosphere. It was kind of difficult to get good reference shots of the non-red-spot sides of Jupiter, particularly to get consistent ones. They were all taken over many different years and influenced by many different weather events so there was lots of variation. 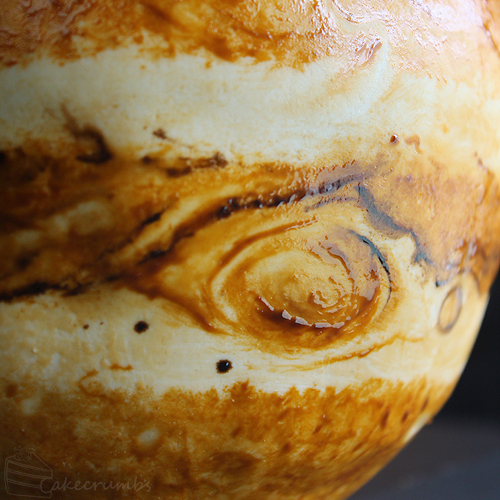 But I got enough to get a rough guestimate of the more static features of Jupiter’s atmosphere. The rest I’ll just claim as artistic license. 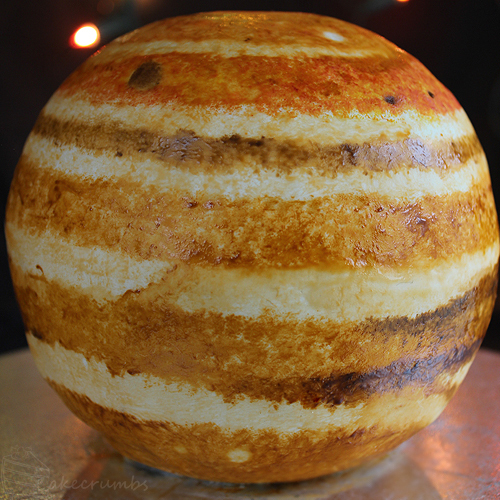 Finally came time to cut the cake and see how there spheres lined up inside. It turned out better matched than I’d anticipated. This run went so much better than the first, informed by the mistakes and lessons learned in the mean time. So I feel much safer sharing the process with you guys now. Stay tuned for that later this week if all goes to plan. ETA: Tutorial is now here. 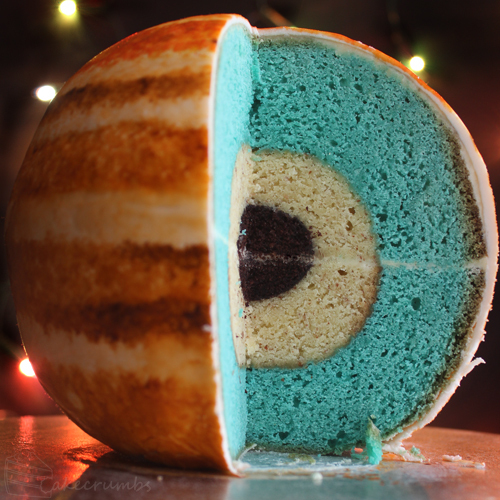 Just out of curiosity, would it be possible to do this cake with an ice cream center, perhaps the inner core? If so, how would I go about doing that? 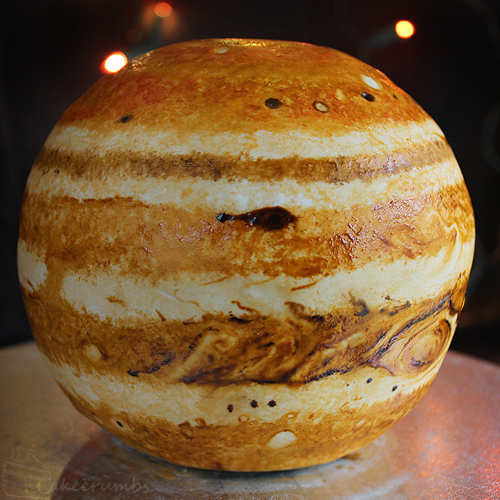 I have definite plans to re-make this with a dessert centre soon — I’m just attempting to acquire the right equipment. if it works there’ll be a tute to follow. It has to be a solid hydrogen core. 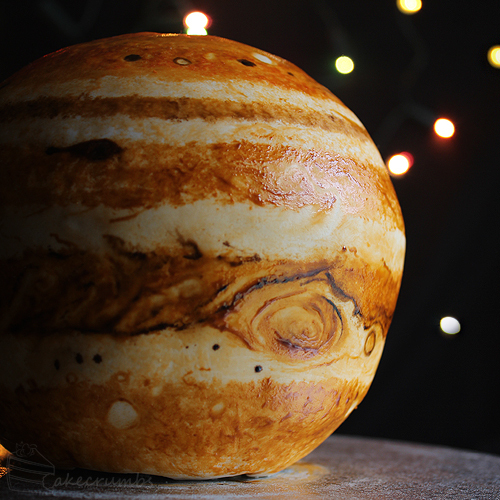 Hi i would like to order the Jupiter cake. Just want to know Do you deliver to sydney. If you do how much would it cost. Can you please let me know. Thakyou. Hi there. Are you the same person I replied to on Facebook? Yes it is. I sent the message here becuase i didnt here from you but I know the answer and thanks for getting back to me. 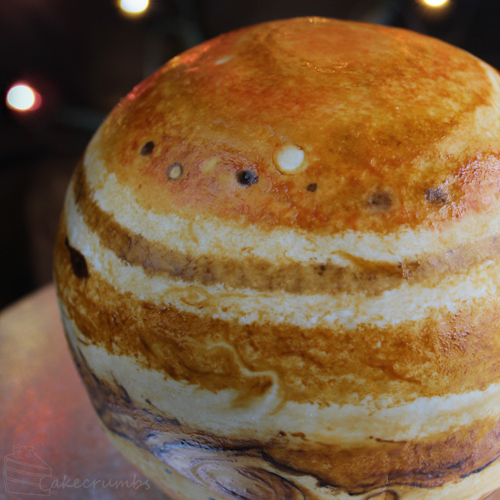 Pingback: Pic of the Day: Jupiter Cake | Snedo – Its Neato! This was incredible – I watched through the video with my mouth hanging open! What an achievement! Again – massive well done! Well, it does look delicious, and scary too. You are a great Baker! This looks impossible to the untrained eye! A million props! You’re so creative ! I would like to know if you have some kind of tutorials where I and my daughter can pay for it to learn how to make them. I will appreciate this. Greetins and have success in everything! 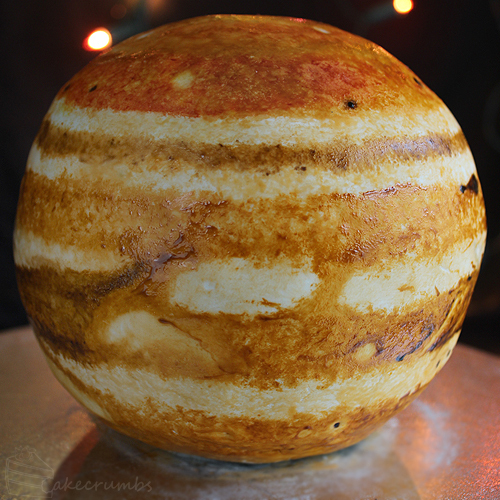 This is the best cake creation I’ve seen, and I’ve watch A LOT of cake shows ect, you’re attention to detail both outside and inside the cake is just incredible, no, not just incredible, incredibly incredible ^_^ I’ll be keeping an eye on your creations in future. hello !!! 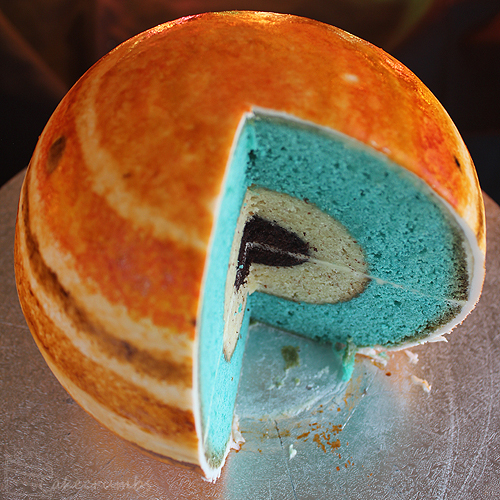 i want to try to make this cake for my son but i wonder how did you make the decoration of the planet ?? ?